ISIS releases new video of Alan Henning, a British aid worker. 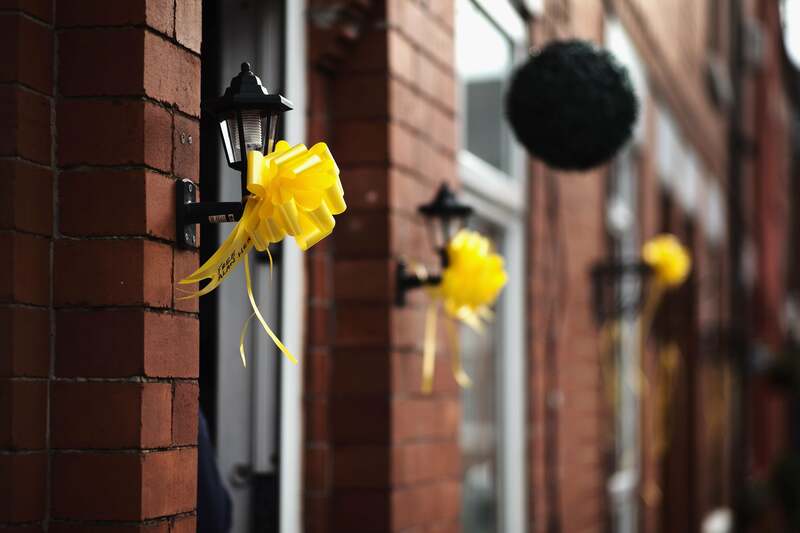 Yellow ribbons hung in support of hostage Alan Henning. ISIS released another brutal video Friday appearing to show the beheading of British aid worker Alan Henning. Henning, a 47-year-old taxi driver from England, was kidnapped by ISIS while delivering food and water to Syria in December. Masked gunmen abducted Henning the day after Christmas, shortly after crossing the border from Turkey. Before being executed, Henning “speaks to the camera, referencing the British Parliament’s decision to join the bombing campaign against ISIS,” according to CNN. Media outlets have not yet verified the authenticity of the video, but the video’s similarities to previous beheadings shot by the group indicate it is real. This is the fourth such video released by ISIS. The full beheadings are not shown in the videos, but the British-accented, English-speaking militant holds a long knife and appears to begin cutting the three men, American reporters James Foley and Steven Sotloff and British aid worker David Haines. Henning appeared in the [previous] video which showed the murder of [British aid worker David] Haines, according to Reuters. In it, a masked man said Henning would also be killed if British Prime Minister David Cameron kept supporting the fight against the militants.